BareED is a RAM based and pixel oriented (not character!) 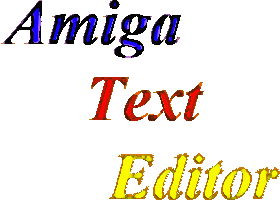 Amiga related text editor. RAM based means that the document (file on disk) must fully fit into memory in order to edit it. Pixel oriented means that every action performed within the edit-area is achieved on a pixel basis. This allows to display proportional fonts (the characters may vary in width) and to use real tabs - although to make it easier for you, tabs will be chosen as amount of characters and internally converted into the analogous amount of pixels. Furthermore, there are almost no hard-coded limits - no line length limit, no file size limit - to name only a few. BareED cannot (truly) compared with normal Amiga text editors who only support fixed-width fonts - because the underlying methods differ very much. 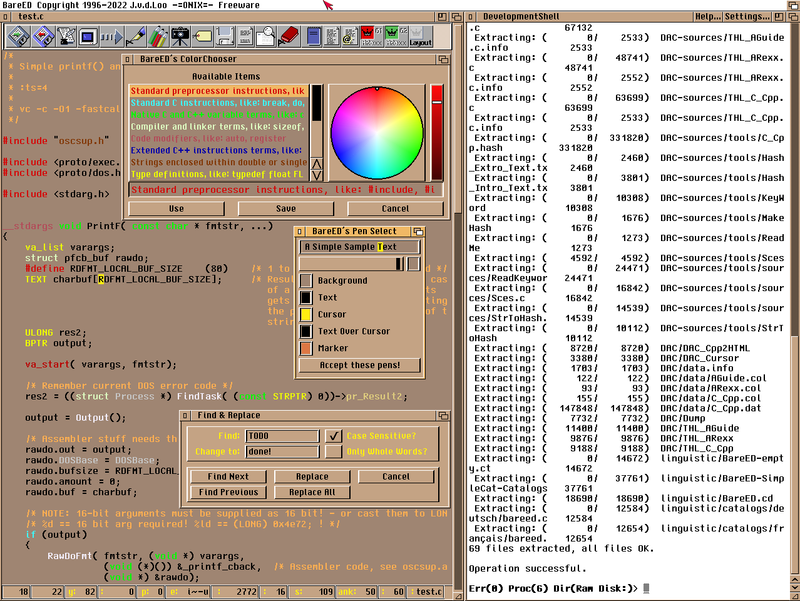 In addition, BareED makes no use of the Amiga console driver - and thus any colour values can be used for the texts or cursor. However, only taking a quick look at BareED will only show you a basic text editor that doesn't seem to offer very much. 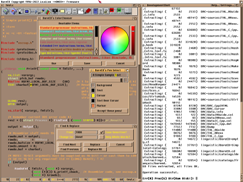 Since I follow the old Amiga rules when programming - namely compact code and no waste of memory - BareED is very tiny for the functions it offers but lacks of a great graphical user interface. For me the GUI isn't very important, I need only a quick and easy to use text editor. Although some people seem to believe that is not possible, or at least nonsense, to add syntax highlighting to a text editor whose character layout matches exactly that of the file on disk, BareED nevertheless has this ability! The problem is here the time required to find out which characters to display in a different colour, because all information must be gathered in real time - and not like - in contrast to other text editors - once after the file has been loaded. BareED will not store these obtained information within the text file or anywhere else - which is the normal method of other text editors. The renunciation on this allows BareED to load and save text files very fast but requires fast CPUs in order to display texts in different colours. So, to find an end - if you have a fast machine (68040 CPU or better) then BareED may work for you. BareED is a simple to handle text editor that shouldn't shower you with a lot of preferences and things you aren't willingly to handle. BareED is no replacement for existing text editors! It was written because the text editors I have used daily, offered me not the choice to use proportional fonts, which is in my opinion, a great lack, and further more, not up-to-date! Thus, if you are satisfied with the text editor you use currently, there is no reason why you should use BareED. Actual screen shot of BareED 0.10011 beta.